Although The Brewer's Art has been around for a number of years, Mr Minx and I had never had the opportunity to dine there until now. Friends from out of town, the very drole Cliff and his partner Doug, was going to be in Baltimore for a few hours en route to D.C. Originally we were going to eat near BWI (giving us very few choices) but when Cliff mentioned that they planned to take the MARC to their final destination, I realized that eating in Baltimore would open up our field of possibilities considerably. The Brewer's Art is less than three blocks away from Penn Station, so it seemed like the perfect destination for the occasion. Plus the current menu, listed on their Web site, had several choices that piqued my interest. We were extremely early for our reservation and had to cool our heels in the shockingly noisy bar with a couple of the house brews. Eventually we were led to our table in the much quieter dining room. I was a bit worried that the noise would carry, considering there was no carpet or drapery to dampen the sound, but it was not a problem at all. Once seated, it didn't take very long for us to make up our minds about dinner. 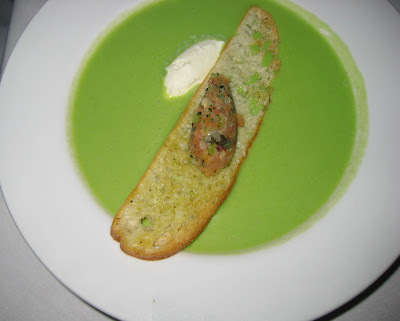 Doug had the chilled asparagus soup with house-smoked Scottish salmon tartare. I didn't get a taste but Doug seemed to enjoy it very much. 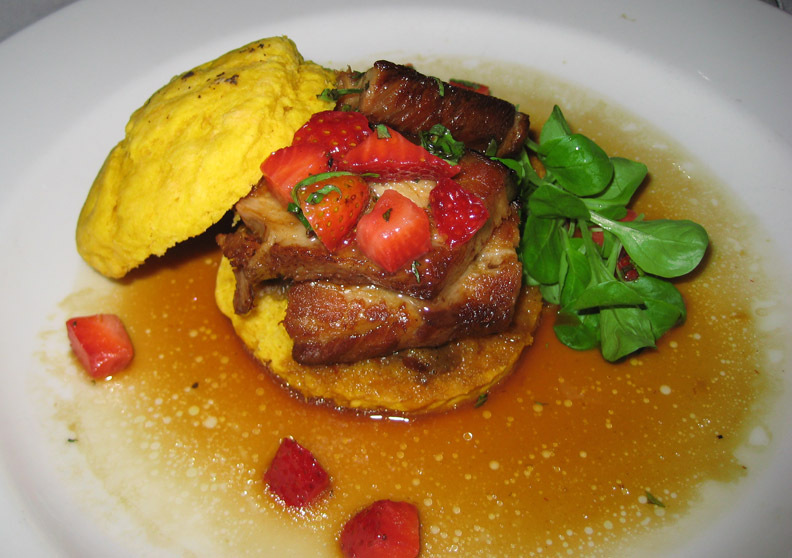 Cliff and I both chose the roasted Berkshire pork belly on a sweet potato biscuit with grilled spring onion-fig jam, strawberry-basil salsa, and natural jus. While the individual elements of this dish were excellent - the pork was succulent, the salsa was tangy, the jam was pleasantly figgy - serving it assembled as a sandwich in a pool of jus made the soft biscuit soggy and somewhat difficult to eat. It was a bit large for an appetizer portion as well. Personally, I'd deconstruct the dish with mini biscuits, swap out the jus for a thicker, drizzle-able, reduction, and serve a dollop of the jam on the side. Keep the flavors but alter some of the textures. On to the entrées. 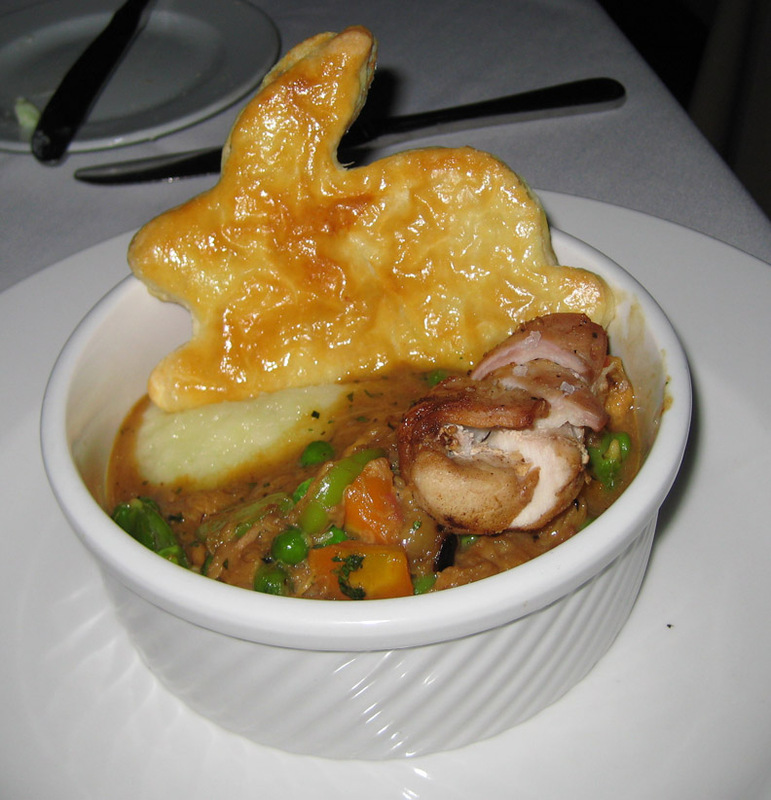 Cliff had the rabbit pot pie which contained the braised leg and roasted saddle in a Madeira-thyme velouté, wtih fava beans, morels, heirloom carrots, country ham, and buttermilk mashed potato, all topped with a puffed-pastry bunny "lid." I didn't get a taste, but judging by the way Cliff hoovered up the dish, I think it was a smash hit. 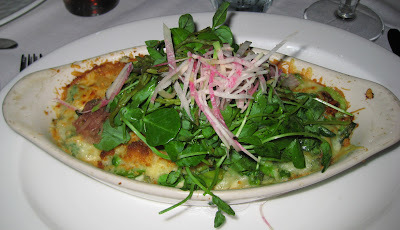 Because my app was so large and meaty, I went vegetarian with my entrée and chose the nettle and ricotta gnocchi with asparagus, fava beans, spring greens and Fontina cream, topped with bread crumbs and pickled spring vegetable salad. 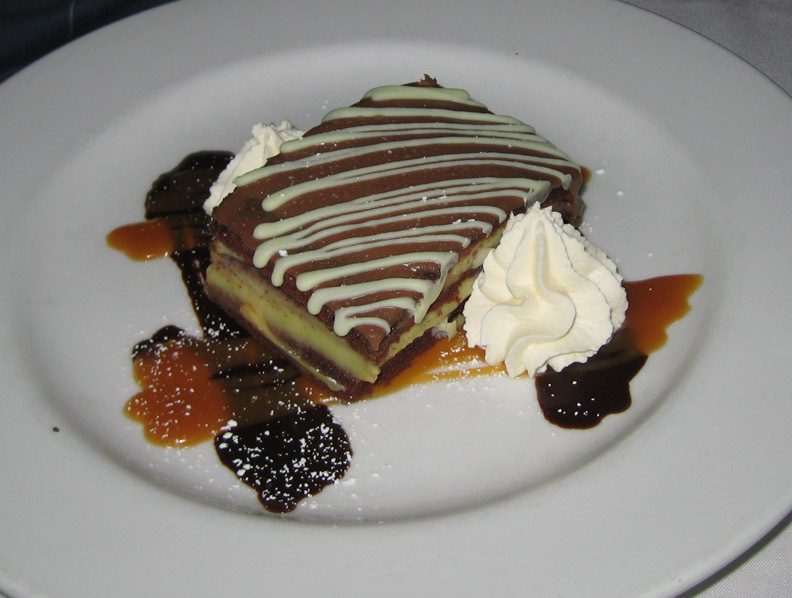 Light as air but as rich as sin, I could only eat about half of this decadent creamy concoction. Not having eaten nettles before, I wasn't sure what they were supposed to taste like, but I am happy to report they did not sting. 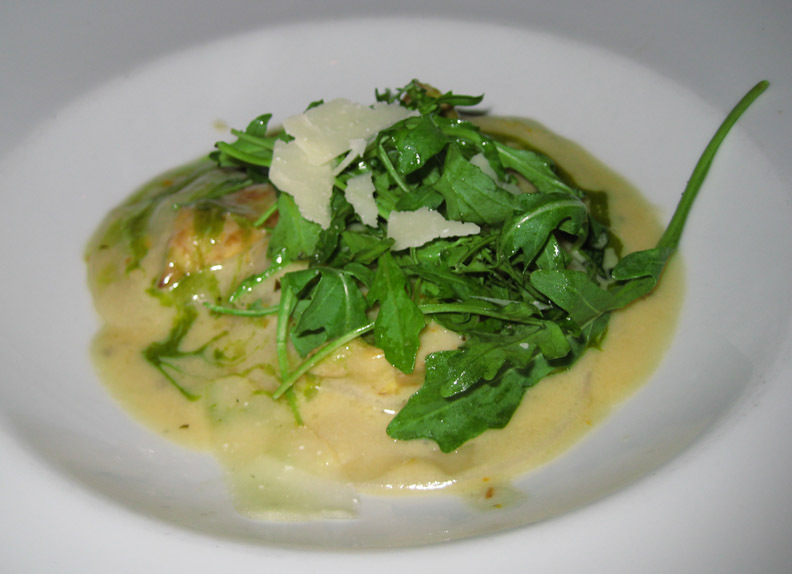 The bits of asparagus and greens added some texture to the fluffy gnocchi, and the pickled salad of salicornia (sea beans) and onion added some tangy zing to the dish. 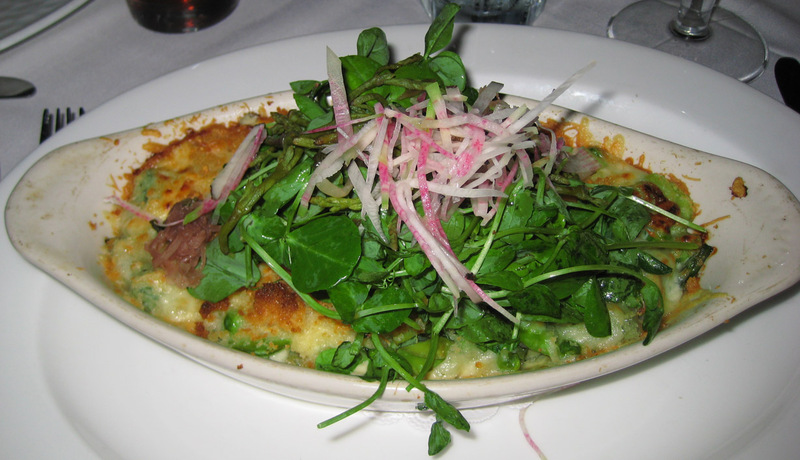 The topping of stemmy watercress, however, was a bit awkward to eat. Both Mr Minx and Doug chose the Ozzy-brined Giannone chicken with hash of caramelized fennel and fingerling potatoes, green olives, grilled Meyer lemon, and a Limoncello sauce. 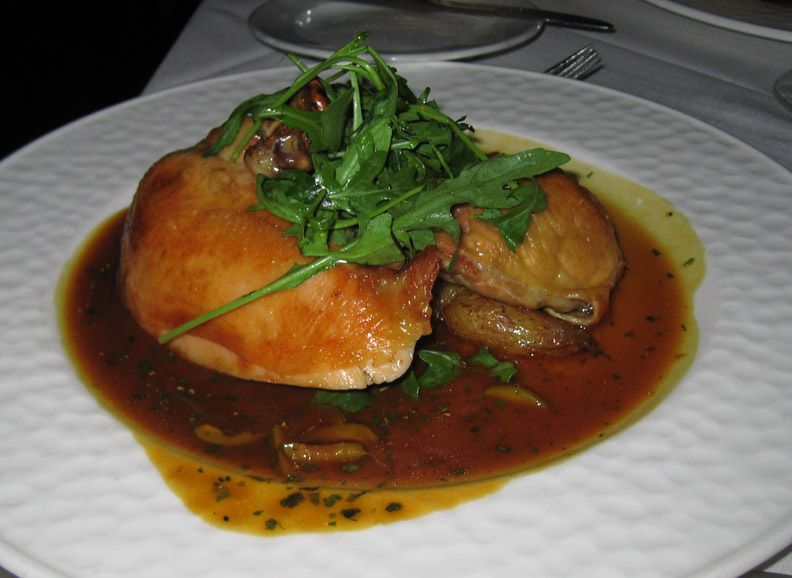 The chicken was perfectly roasted with a delicately crisp skin, and the sauce was richly chicken-y with a hint of lemon. Mr Minx was momentarily worried that the Limoncello might make things too sweet, but that was not the case at all. 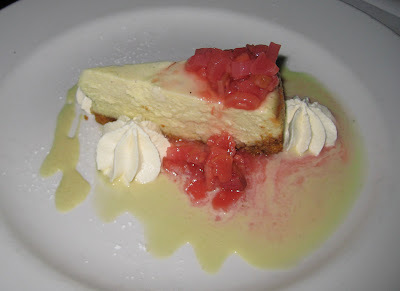 Mr Minx had the chevre cheesecake, which despite being a sweet cheesecake had a nice savory aspect from the goat's cheese. I enjoyed my bite and really should have sneaked another one. Or two. I chose the coffee pot de creme. The first time I ever had a pot de creme, it was a baked custard, and that's what I expect every time I order it. And every time I am disappointed by something the consistency of pancake batter. This was no different. Under about half a cup of sweetened whipped cream I found an equal amount of coffee-flavored glop. 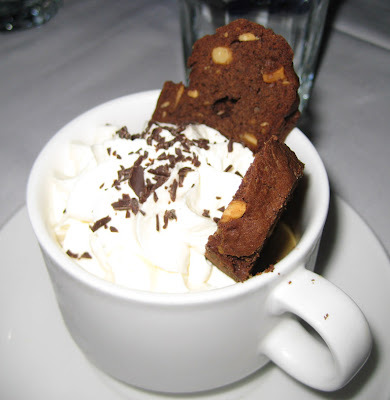 This is not pot de creme, people. It tasted fine and the crunchy chocolate biscotti (which weren't really biscotti-textured) helped, but I was still disappointed. Not bad to have only one disappointment in the evening, huh? Cliff thought his meal was "astonishingly good," which is quite a high compliment. I agree that overall it was a very fine meal and that my quibbles are pretty minor and really only based on my personal preferences. And the service was terrific - quiet, prompt, unobtrusive. I'd eat there again in a heartbeat. Did you have any of their beer? When I was living in Maryland, I loved to go up to Brewer's Art with friends, sit by the fire, and order the garlic rosemary fries and a Resurrection Ale. Though I suppose looking at your meal, beer may not have been the best compliment. Oh yeah! We all had beer. Doug and I had Resurrection and I can't remember what my hubby and Cliff had. And the beer went surprisingly well with the food. Grand time! ... And all I remember was that I picked the peppercorn boozy beer. It was really different and VERY good! Again, had such a lovely time with y'all!